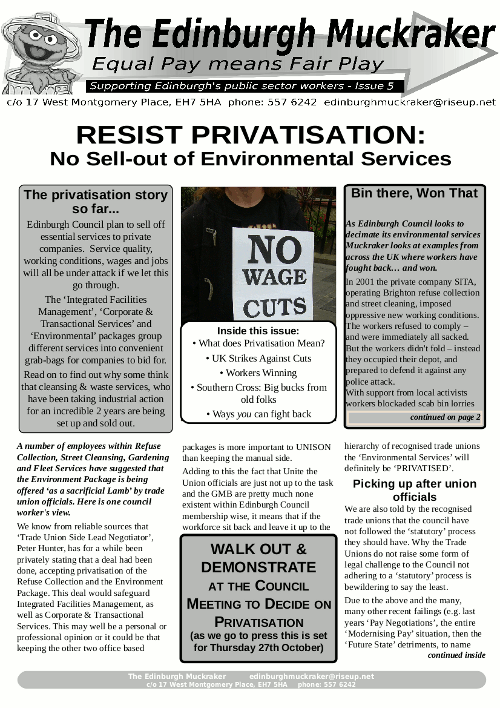 This issue of Edinburgh Muckraker was produced in response to the upcoming vote by Edinburgh Council on Oct 27th on the privatisation of council services, and to support the refuse collection workers and street cleaners in their ongoing dispute - so far hundreds of copies have been distributed at waste depots and council offices around the city. The Edinburgh Muckraker is produced by an independent group in solidarity with council workers, to inform the people of Edinburgh what is really going on behind the lies, misinformation and threats. We encourage and assist effective action to win this dispute. We aim to help Council and other workers to come together across sectional and union divides. Edinburgh Council plan to sell off essential services to private companies. Service quality, working conditions, wages and jobs will all be under attack if we let this go through. The ‘Integrated Facilities Management’, ‘Corporate & Transactional Services’ and ‘Environmental’ packages group different services into convenient grab-bags for companies to bid for. Read on to find out why some think that cleansing & waste services, who have been taking industrial action for an incredible 2 years are being set up and sold out. A number of employees within Refuse Collection, Street Cleansing, Gardening and Fleet Services have suggested that the Environment Package is being offered ‘as a sacrificial Lamb’ by trade union officials. Here is one council worker's view. We know from reliable sources that ‘Trade Union Side Lead Negotiator’, Peter Hunter, has for a while been publicly stating that a deal had been done, accepting privatisation of the Refuse Collection and the Environment Package. This deal would safeguard Integrated Facilities Management, as well as Corporate & Transactional Services. This may well be a personal or professional opinion or it could be that keeping the other two office based packages is more important to UNISON than keeping the manual side. Adding to this the fact that Unite the Union officials are just not up to the task and the GMB are pretty much none existent within Edinburgh Council membership wise, it means that if the workforce sit back and leave it up to the hierarchy of recognised trade unions the ‘Environmental Services’ will definitely be ‘PRIVATISED’. We are also told by the recognised trade unions that the council have not followed the ‘statutory’ process they should have. Why the Trade Unions do not raise some form of legal challenge to the Council not adhering to a ‘statutory’ process is bewildering to say the least. Due to the above and the many, many other recent failings (e.g. last years ‘Pay Negotiations’, the entire ‘Modernising Pay’ situation, then the ‘Future State’ detriments, to name but a few) a number of employees within Refuse Collection and Street Cleansing and other sections within the ‘Environmental Package’, have decided to take matters into their own hands. Refuse Collection employees have sought representation from a private lawyer to fight the council on issues that Unite the Union have failed to address and there is also talk of a mass walk out of staff (along with Street Cleansing & Gardeners) on the day Edinburgh councillors will make the decision whether to privatise the Environmental Service. At a recent Street Cleansing workplace meeting with Enterprise, they admitted that there would be cuts to staff numbers and vehicles. Staff were not fooled by the promise of stopping the unpopular 9pm finishing time within Street Cleansing and saw it for what it was, a saving of £2000 per head. In theory staff being transferred to a private company should have their pay and conditions protected by TUPE legislation. However this does not offer genuine protection as 'a new employer may seek changes for economic, technical or organisational reasons’. This means that once a new company takes on the workforce it can begin to cut wages or change working conditions on day 1, after the transfer from the council. Remember that this is not a fight for a pay rise or to keep public holidays or annual leave or to protect pensions or any other terms of condition we have, these are all important and can be fought after we fight privatisation. This is a fight against privatisation and is a fight to keep control of the services with the people of Edinburgh and if you are an employee it is simply a fight to keep your job. As Edinburgh Council looks to decimate its environmental services Muckraker looks at examples from across the UK where workers have fought back… and won. In 2001 the private company SITA, operating Brighton refuse collection and street cleaning, imposed oppressive new working conditions._ The workers refused to comply – and were immediately all sacked._ But the workers didn't fold – instead they occupied their depot, and prepared to defend it against any police attack._ *With support from local activists workers blockaded scab bin lorries and persuaded employment agency workers not to scab. *So effective was this direct action that after 4 days occupation, the workers won their struggle. The Council were forced to terminate the private contract and bring the service back in-house, while re-instating all the workers who had been sacked. More recently refuse workers in Leeds faced a much longer battle against pay cuts amounting to £5k per year. On the 5th September 2009 refuse collectors walked out on strike after 70% voted in favour of action. This would not be a token one day effort but all out strike. Leeds Council confidently predicted that the workers would crumble within 2 weeks. Then they used the media to try and eradicate public support for the bin men accusing them of being “lazy” and “putting vulnerable people at risk” This failed. Massive public support saw local residents join picket lines and donate cash to the strikers. Growing increasingly desperate the Lib Dem authority threatened the workers with privatisation and brought in an army of scabs to do the work, confidently assuring residents their rubbish would now be collected. The workers would not be intimidated and held out as private agency staff failed to cope with the workload. After 11 weeks of all out strike action the Council crumbled and the 500 workers marched back to work having won complete victory against the planned pay cuts. Bin Latest: An update from inside the refuse collection department. On 19 August refuse collection workers voted to call off their 2-year overtime ban opposing wage cuts and worse conditions. But the workers are continuing the work to rule, which is mainly about strictly following health and safety procedures. The meeting was poorly advertised, with only 30-40 workers present. In April, 150-200 refuse collection workers had held a mass meeting and 80-90% voted in favour of a strike ballot. However the Unite union did nothing to implement the ballot. At the same meeting workers voted to restart the unofficial Saturday pickets against scabs breaking the overtime ban, mainly operating out of the Craigmillar depot. Nearly 50 workers have independently taken the Council to Employment Tribunals, to maintain their current wages and conditions. The Tribunals are due to restart in early October. Workers are deeply frustrated with the union. A recent branch meeting voted overwhelmingly to remove Unite convener Stephen McGregor, as the workers felt he was not giving them any information and they had no confidence in him, he was not defending the workers' rights. However McGregor refused to step down, to the workers' anger. We say: The need for independent workers' organisation is clear. Last month workers in Southampton carried out a week of targeted strike action against brutal cuts imposed by the local council. The strikes follow months of anti-cuts action by locals, but the immediate cause of the dispute was the council’s demand for workers to take a pay cut and accept hundreds of job losses. When these demands were rejected by the workers’ unions, the council announced that the entire workforce was sacked - saying that any worker who reused to sign the new contracts the council had drawn up would lose their job. At the same time, a leaked document showed that 1200 workers, a quarter of the workforce, would be laid off over the next few years anyway. The response from said workforce was, unsurprisingly, furious. Workers from across the public sector in Southampton took part in the strikes, which were planned to cause maximum disruption to the running of local government. Those stopping work included binmen, health inspectors, parking wardens, street sweepers, childcare workers, library workers and social care workers among others. A protest march through the town attracted hundreds of workers, ending by protesting outside the local guildhall during a meeting of the council. Despite significant disruption to the life of the town, including festering piles of rubbish in the streets, most workers reported that support from locals remained strong. While most of Southampton's workers have had to sign the new contracts, under protest, there are still groups of workers who have not who now face the prospect of lockouts, and the struggle isn’t over yet. Unite and Unison, two unions associated with the week of action, say they are pursuing legal action on the grounds of unfair dismissal of council staff. As we go to press, a one day strike by social workers has been extended to a full seven days, continuing into the beginning of August, to coincide with strikes by workers in other sectors including adoption, fostering and childcare over the next few days. SNP and Lib Dem run the council. Neither said they would privatise services, but now City of Edinburgh Council wants to push through the largest privatisation of council services in Scottish history. Previous bidder, Veolia, was turned down in part due to their culpability for the release of toxic fumes which caused staff to need medical treatment. Yet the £1 billion privatisation plan still looks like it could go toxic. Two bidders are still in the running, Kier Group and Enterprise, despite concealing criminal convictions for fatal workplace accidents, even when given the chance to ‘come clean’. Several of the firms have been issued with fines for illegal price-fixing in public sector contracts. Kier Group receiving the largest fine, originally amounting to £17.9m. Yet elected councillors were never informed of this. There are 3 significant reasons why there needs to be public consultation before preferred bidders are announced. The sheer scale of the privatisation, effecting 17 services will affect every citizen. The gross mismanagement of the Trams project and the social care tender has led to a reputational crisis for the Council. The council have already failed to meet legal obligations in the tender process. On the 30th June, 30,000 members of the Public and Commercial Services Union in Scotland joined three quarters of a million public sector workers across the UK in striking over pensions and cuts. This was a massive step in fighting back against Government attempts to decimate the welfare state but anti-cuts activists, public sector workers and service users are calling for further, more widespread action. Union branches acrosss the country, including Unison's 9,000 strong Edinburgh branch, have voted to call on the TUC to coordinate a general strike. It looks like there is a possibility of mass joint strike action taking place in October if union leaders respond to the calls of their membership and those that use public services. But we can't wait for union officials to start action – we have to make links now between workers & service users. People from different workplaces could meet to discuss their struggles, to find ways to support each other. No group and no person should be left to struggle alone. On 30 June claimants from Edinburgh Coalition Against Poverty joined the Jobcentre workers picket at High Riggs, and Black Triangle disability rights group members joined the pickets at the Scottish Government. Privatisation means elderly care comes a poor second to profits for hedge fund speculators. Edinburgh Support Workers’ Action Network (SWAN) looks at the disastrous effects of privatisation on the care of our elderly and speaks to a worker at a Southern Cross home in Edinburgh. When the UK's biggest private care home provider Southern Cross announced one Monday that it could no longer afford to pay rent for its care homes and would cease operations it blamed falling local authority funding and rising rent prices. However, a closer look at the causes demonstrates the danger of allowing private companies to run essential public services. Southern Cross, whose 750 care homes receive substantial funding from the tax payer, was purchased by US private-equity firm Blackstone in 2004. Blackstone floated the company on the stock market, making £630_million in the process, and proceeded to strip its most profitable assets, making another £1_billion by selling off property belonging to the company. Southern Cross then continued to provide services by renting the care homes it previously owned. Blackstone sold its shares in Southern Cross in 2008 making a final £1 billion in profit and leaving behind a company crippled by the rising cost of rents. Now Southern Cross has announced it cannot afford to pay its rent bill and the company will fold. A few private investors have made billions, while the 31,000 elderly residents of Southern Cross' care homes face an uncertain future. The Council have yet to decide on the privatisation of services, they say. Why then did a BT Telecom engineer turn up at the Craigmillar cleansing/ refuse collection depot on 11 August to install a new phone line for the private company Enterprise? The very same company who are bidding for the Environmental Services contract. The manager sent the engineer packing, explaining the decision on privatisation had not yet been made. But who from the Council authorised this?